The Motorola G series has long been the go-to affordable phone to buy. Since being swallowed by Lenovo, however, Motorola's strategy has had to change to challenge with its competition. 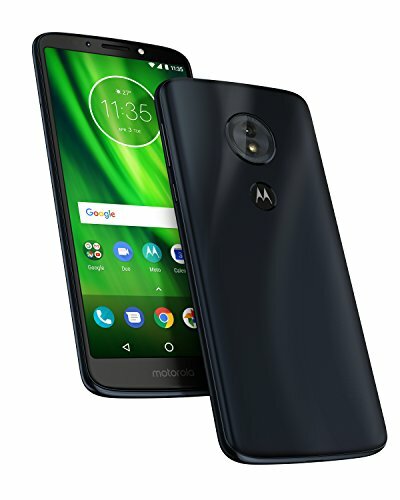 As a result the Moto G6 Play represents a big change for the series. It's the most affordable out of the trio of G6 models (Plus and 'standard' are also available), delivering the largest battery capacity of the three - but for the smallest price. Motorola Moto G6 Plus review: What's the big deal? Like its G6 brothers and sisters, the Play considerably ups the quality compared to earlier generations in the series, presenting a more design-focused shift. That means a more expensive handset than earlier G series models, but that's no surprise given a market that's not only dominated by Apple, Samsung and Huawei at the top-end, but many other companies in the mid-price sector. Has the Moto brand made the right moves to reassert its affordable phone dominance, or does the G6 Play lack in the current market? The Play is the most affordable G6 on account of its pared-back design. It's not bad looking by any means, but rather than using glass or metal like the other G6 models, its back is instead covered in an attractive glossy plastic. Our review model is a dark blue and you might even think it's glass when viewed from a distance. Grab ahold of it and it becomes immediately clear that it isn't, though - but that means it's less slippery, doesn't attract fingerprints quite as easily, and is lighter too. The Play roughly mimics its more expensive siblings' designs, even if it is the budget option of the bunch, although the front is slightly different: there's no fingerprint scanner here (it's on the rear instead), which results in relatively little bezel and a longer aspect ratio screen. It's not a fully clutter-free design, though, as there's a Motorola logo on the bottom chin, as well as a front-facing LED flash alongside the earpiece and selfie camera on the top, all of which add to the edging. It's no Vivo NEX, put it that way. Wired headphone users will be pleased to know the Moto offers a 3.5mm jack on the phone's top edge, while the bottom edge plays home to a Micro-USB port. It's a shame to see such a dated port on the bottom of this phone, especially with so many other phones adopting Type-C (the other two G6 models included). Overall, the G6 Play looks and feels like a modern smartphone that's appears a step above its asking price. It's perfectly good for day-in day-out use and certainly doesn't look like a cheapie, thus cementing the G6 series' new and more premium appearance success. You'll find slight compromises across the board in almost any low-cost smartphone. With the G6 Play's display that's presented in form of a lower resolution. Rather than the more common Full HD (1080p) resolution, Lenovo has opted for HD+. On this longer aspect ratio screen, that means 720 vertical lines, with 1440 horizontal ones. And that isn't nearly as terrible as it might sound; held at arm's length and the G6 Play's details are plenty good enough. Colours from the LCD panel are accurate to our eyes, while colours have ample pop. That said, colours aren't the most vivid and bright we've ever seen, as to be expected. Bright green app logos, for example, still shine through. Being a longer aspect ratio means the G6 Play has an ideal canvas for Netflix Originals shot in 18:9, filling the screen with video rather than adding horizontal letter-boxing or vertical black bars on the side. If you like to watch flicks while holding the phone close to your face then you'll perhaps notice a little roughness around finer details, but as that's not how anyone is likely to hold the phone, it's not worth worrying too much about that. As has been the case for some years now, the software loaded on to any new Moto device is clean and minimal, based on the stock Google Android operating system. Motorola does add some of its own additions, housed in a single point of entry, via the Moto app. This handles Display, Actions and Voice, for various automations of the phone's functions. Whether that be scheduling when the screen goes into night-time mode, killing the blue light to help relax your eyes towards the end of the day, or actioning responses via physical gestures, it's neatly arranged and easy to adjust such controls. In addition, the ambient lock screen - which has been a staple of Moto phones for years - is also found here, giving you a quick-look at the clock and access to notifications snippets, all without needing to unlock the phone. With any budget smartphone, it's worth remembering not to set your expectations too high when it comes to performance. Clearly, with a Snapdragon 430 processor inside with either 2GB or 3GB of RAM (it's region dependent, too), the G6 Play's performance is fine - but isn't going to blow you away. However, it's about as good as you'll find from a sub-£200 phone. Things that would normally be achieved in a split-second on a high-powered flagship take a little longer in the Moto G6, but it's not an unreasonably slow device. General interactions feel fast enough, such as launching the app drawer, swiping through home screens or dropping down the notifications shade. It's other tasks that take a bit more time. Anything that requires data to be downloaded - whether that be web browsing, downloading music for offline playback or additional files for games - all take longer with this phone than on a pricier and more powerful device. Launching games can take a little bit of extra time, too. Still, it's never so slow to be frustrating. We could comfortably use the G6 Play as our main daily device without becoming fed up with its speed. Where the G6 Play really shines is with its impressive battery. It's a 4,000mAh cell inside which, for those who pay attention to such things, is noticeably more capacious than what's on offer in most handsets. Even the regular Moto G6 has 3,000mAh, while long-lasting phones like the OnePlus 6 has 3,300mAh. It's not all about the numbers though, it's about how it functions in the real world. And this battery more than does the business. With light/moderate use we've been pushing this phone through to the evening of a second day. In fact we'd be surprised on the odd occasion that we finished the first day with less than 50 per cent charge remaining, having started the morning with a full battery. It's that good. When the battery does run empty, the provided TurboPower charger does a great job of topping it up quickly. If, for instance, the Play phone runs empty in the middle of the day, you can plug it in for 15-20 minutes and have enough power to see you through the rest of the day. That helps to take away any battery anxiety. In a way, however, it's odd that the other G6 models don't have larger batteries. We'd rather have the G6 Plus' power with a more capacious battery and pay a little bit extra for the pleasure. The Play's prominent battery but lower-end overall spec won't be a logical selection for all users. Another frequently compromised area in budget smartphones is the camera experience. That's the case in the G6 Plat to some degree, although it's not too bad for such an affordable device. The 13-megapixel rear camera takes decent enough images in daylight, retaining ample detail and natural colours to make attractive social-friendly photos. In low-light, as expected, results drop in quality considerably, with details starting to get a little ropey and colours fading. We can't be too critical, though, as it is a budget smartphone and it's a decent enough camera for the asking price. For a phone that costs only £170 the Moto G6 Play offers a whole lot of goodness. Its biggest selling point is its battery life, which just goes on and on. Even power users would struggle to drain it in a single day. The problem with the G6 Play, however, is that it's one of three G6 phone options. As the baby of the pack, its huge battery capacity seems oddly matched with its modest power. The camera proposition isn't that great either. For those hunting out an affordable phone, the G6 Play brings the series' design bang up to date, while offering fuss-free software, in a great all-round package. Its only threats come from the wider G6 range and some increasingly popular brands like Honor and Nokia. But none of those can compare when it comes to the Play's battery life credentials. This year's 'regular' Moto G comes with a higher-resolution screen, more powerful processor, more memory and more storage than the Play, plus a glass build. With that premium bump comes a bump in price, though. HMD Global is going full-on with its launch of Android-powered Nokia smartphones. Among those is the Nokia 5.1, available at a similar price to the G6 Play, but which has a more premium aluminium chassis, a higher-resolution display, and runs on the Android One platform (which is like stock Android). The drawback: its battery is nowhere near as capacious, so won't last as long.